The Linguistics Program is excited to welcome Assistant Professor Jennifer Cramer to its faculty! New Faculty 2014: Jennifer Cramer by UK College of Arts & Sciences is licensed under a Creative Commons Attribution-NonCommercial-ShareAlike 4.0 International License. Compressed Course: "An Introduction to Text Mining and Textual Data Analysis for the Humanities and Social Sciences"
A special 1-credit opportunity to discover text mining and textual data analysis. Across many disciplines, interest is increasing in the use of computational text analysis in the service of answering questions in the humanities and the social sciences. Media scientists analyze social media in order to predict corporate crises, political scientists and economists look for indicators of mood and sentiment in platform speeches and economic forecasts, literary scholars analyze the distribution of motifs in large numbers of texts in different literary epochs, and social historians and sociolinguists look for networks and connections among the people, places, and times related to the documents they study. Following the distinction between "digitized" vs. "digital" scholarship, computers not only assist the work of researchers (digitized scholarship) but also transform the basis of the scholarship: they foster research that would have not been possible without digitization and increasing computing power (digital scholarship). Mapping emotions by mining huge numbers of books, or searching all Latin texts from Antiquity for paraphrases of Plato, are only two examples of investigations documenting the innovative potential of digital research. This transformation makes it necessary to reflect on the new relationship of scholars to their objects of investigation and to discuss the new ways researchers handle textual "data". In this course we will familiarize ourselves with the concepts, debates, and selected tools within text-based digital scholarship and discuss the repercussions on the way we perceive and construct our objects of research. Public Lecture: "Terrorist Spotting for Beginners: Mass surveillance through language"
Mass surveillance is only possible with the help of smart computer algorithms. Whenever text data is monitored by machines, methods from computational linguistics come into play. The main goal is to automatically filter and identify content that points to certain attitudes or behavioral dispositions viewed as a threat to security. When monitoring online data, the task is even more complicated. Since people are not usually required to provide their real identity in cyberspace, the tracing of identities through language features ("writeprint") is another challenge for computational linguistics at the service of the intelligence apparatus. 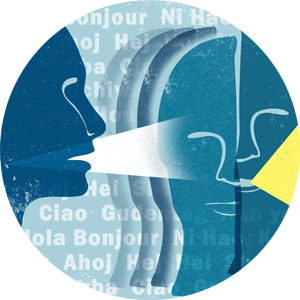 Surveillance through language relies on the idea of the expressive function of language: Whenever we utter something, we do not just say something about the world to someone else, we also reveal something about ourselves. In my talk I will give a critical account of some of the linguistic methods used to automatically attribute identities such as "extremist", "endangerer", or "potential terrorist" on the basis of text analysis. Starting with an overview of the political, legal, and technical framework of state surveillance measures in Germany, I will discuss core concepts of the surveillance discourse and present examples of how linguistic knowledge can be used to assign identities for the purpose of control. In doing so, I hope to foster a discussion on the logic of surveillance in western democracies and the responsibility of the sciences and humanities. Linguistics Seminar: "On the Prescriptivity of Imperatives"
Come hear about the logical form of imperatives, and what sets prescriptive language apart from ordinary descriptions and questions! Linguistics Seminar: "Data-Driven Compound Analysis"
"Speakers of German enjoy forming compounds and the German language is infamous for long words like 'Rindfleischetikettierungsüberwachungsaufgabenübertragungsgesetz". Even though compound formation is an easy task for speakers, the linguistic analysis of the semantic relations of the stems of a compound is a complex task. This talk will discuss possibilities of how we can use compound analysis for a deeper understanding of cultural change, discuss data-driven methods, and present empirical evidence from large German newspaper corpora. The talk will present: 1. a quick overview of the different word formation processes in German, 2. different heuristics for the semantic analysis of compounds, 3. analysis of distributional patterns of stems in large corpora, and 4. possibilities of a data-driven identification of the semantic relations between the stems." Proto-Indo-European, which Dr Byrd studies, is the prehistoric ancestor of hundreds of languages, including English, Spanish, Greek, Farsi, Armenian, and more. Just recently, the Linguistics Program's Andrew Byrd was interviewed by the BBC's Newsday radio series. The interview served to highlight Byrd's work studying the "Proto-Indo-European" language which dates back thousands of years. In the interview, Byrd gives listeners a glimpse of the language's history and a chance to hear the language given breath. A special thanks to the BBC World Service and The World Today as well as the College of Arts & Sciences and the Linguistics Program for making this podcast possible. UK linguistics Professor Gregory Stump co-authored "Morphological Typology: From Word to Paradigm," with computer science Professor Raphael Finkel.